The start of the 19th Century also marked a new beginning for the United States half dollar. After a three-year hiatus, this large silver coin returned in 1801 with a new design: the Draped Bust/ Heraldic Eagle type. The United States Mint wasn't yet ten years old at the time, but this was already the third different design to appear on the fifty-cent piece, the two earlier series having lasted just two years apiece. Clearly, federal officials were casting about for just the right combination of symbolism and artistry to showcase on the young nation's coinage. 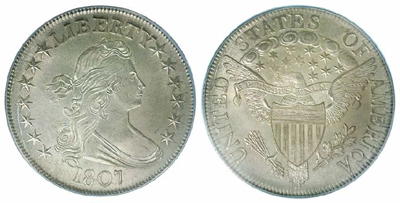 The first half dollar, introduced in 1794, had been of the so-called Flowing Hair design. Its obverse bore the portrait of a youthful female figure whose hair flowed freely behind her; its reverse depicted a small, spread-winged eagle surrounded by laurel branches. After just two years of production, the Mint replaced the youthful likeness of Liberty with a more mature, almost matronly portrait, one commonly known as the Draped Bust type. Initially, however, it retained the small eagle, with subtle modifications, on the reverse. This design appeared on half dollars for only two dates: 1796 and 1797. When the series resumed after the turn of the century, the naturalistic bird had given way to a larger, more formal eagle with a shield superimposed upon its breast: the now-familiar heraldic eagle design. This new series, too, was destined to be short-lived, lasting just six years. But, during that time, the Mint's total output greatly exceeded the levels of previous years and, for the first time, the half dollar came to enjoy widespread use. The Draped Bust portrait of Liberty may have resulted from the intercession of President George Washington himself. Its designer, painter Gilbert Stuart, is best known today for his portrait of Washington still used on the one-dollar note. Numismatic researcher R.W. Julian speculated that the president, being keenly interested in upgrading United States coinage, may have arranged for Stuart (whose work he much admired) to prepare this design. It's said that Stuart's model was Mrs. William Bingham (nee Ann Willing), a Philadelphia socialite viewed by many contemporaries as the most beautiful woman of her day. Stuart's drawing was transferred to plaster by sculptor John Eckstein of Providence, Rhode Island. Robert Scot, the Mint's chief engraver, executed the coinage dies. In his highly acclaimed book Numismatic Art in America, Cornelius Vermeule characterized the Draped Bust version of Liberty as "a buxom Roman matron" and observed that "her full face has been endowed with a Roman dignity that recalls some massive marble bust of Minerva or Dea Roma, goddess of Rome and her empire ..." Gilbert Stuart, however, was not satisfied with Scot's interpretation of his work, and he disavowed all responsibility for it. Only years later was his association with this coinage rediscovered. On half dollars of the Draped Bust type, the word LIBERTY appears above the portrait and the date below. Thirteen stars surround Miss Liberty on all coins of this series having the Heraldic Eagle reverse. This represents a refinement of the earlier Draped Bust coinage, on which the number of stars varied from fifteen to sixteen, depending on the number of states in the Union at the time. Rather than subject this element of the design to continual change, Mint officials settled on a number reflecting the thirteen original colonies. Thirteen stars also appear on the coin's reverse, arrayed above the eagle. Chief Engraver Scot modeled the heraldic eagle after the one on the nation's Great Seal. Unaccountably, however, he reversed the positions of the arrows and olive branch held in the eagle's claws, placing the warlike arrows in the symbolically more important dexter (or right) claw and the olive branch of peace in the sinister (or left) claw, thereby contravening the Founding Fathers. A ribbon bearing the motto E PLURIBUS UNUM hangs from the beak, with UNITED STATES OF AMERICA around the upper rim. On the edge of each coins is the statement of value: FIFTY CENTS OR HALF A DOLLAR. Draped Bust/small eagle half dollars had been struck in minuscule quantities, with a total two-year mintage of fewer than 4,000 pieces. By contrast, more than 1.6 million Draped Bust/heraldic eagle half dollars were minted over the years, with 1806 alone accounting for more than half that total: 839,576. Despite their relatively high mintages, few Draped Bust/ heraldic Eagle half dollars were preserved in pristine mint condition. There just weren't many collectors around in those early days. In any event, fifty cents was a lot of money to set aside, representing a day's pay for many working-class Americans. Large numbers of these coins survive in the higher circulated grades, because banks routinely held them for use in inter-institutional transactions. Grading this type can be challenging. Weak strikes were common, reducing the number of choice examples. Points to check for wear are the hair above Liberty's forehead and the eagle's breast feathers. Proofs were not struck for this series. Draped Bust and Capped Bust half dollars both are widely collected by Overton die varieties. These are listed in the standard reference book Early Half Dollar Die Varieties 1794-1836 by Al C. Overton. In 1807, Draped Bust halves gave way to a new version designed by Scot's assistant, John Reich. This was the Capped Bust type, on which Miss Liberty turned from facing right to facing left and tucked her newly curled hair inside a cap. BIBLIOGRAPHY: Breen, Walter, Walter Breen's Complete Encyclopedia of U.S. and Colonial Coins, F.C.I. Press/Doubleday, New York, 1988. Overton, Al C., Early Half Dollar Die Varieties 1794-1836, Third Edition, Escondido, CA, 1990. Taxay, Don, The U.S. Mint and Coinage, Arco Publishing Co., New York, 1966. Yeoman, R.S., A Guide Book of United States Coins, 47th Edition. Western Publishing Co., Racine, WI, 1993.